What's Happening with Captain Phasma & Maz Kanata in The Last Jedi? Rian Johnson's The Last Jedi is getting ready to hit theaters and a whole bunch of new information has been revealed about the roles of Maz Kanata and Captain Phasma in the movie. A new children's book has spoiled what the beginning of the movie will look like as well as introducing some new sea monsters on Ahch-To and showing off some more of the Caretakers and those new millennium Ewoks, the Porgs. 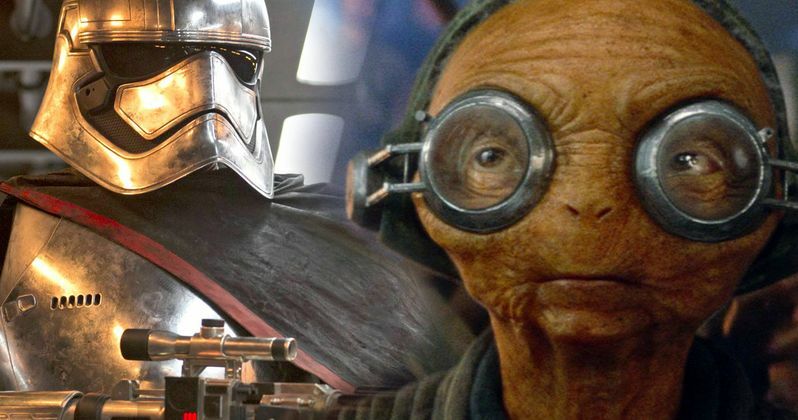 While Lupita Nyong'o's Maz Kanata had a pretty substantial role in The Force Awakens, it appears as if she will have a smaller role this time around and that Gwendoline Christie's Captain Phasma will have a larger role than she did previously. All of the new information comes to us via Entertainment Weekly's latest cover story on The Last Jedi. When talking about Kanata, Rian Johnson has hinted that we may not get the full extent of her knowledge this time around. On the other hand, Johnson talked about how much fun that he had on set with Nyong'o. The director explains. "She has a smaller part in this than she has in The Force Awakens, but it's a really fun part, and Lupita is so awesome, I'm just happy I got to work with her... This was my first time working with mo-cap characters and working with actors in that way, I feel like I got such an incredible education watching Lupita work." On the other side, the First Order's Captain Phasma will see some more action this time around as opposed to her small bit of screen time during The Force Awakens. Many fans were disappointed that Captain Phasma played such a small role in the movie after seeing her in a lot of the promotional material leading up to the release. Johnson revealed his love of the character and his excitement to get her into some "action" this time around. Johnson had this to say. "Gwendoline Christie is one of my favorite people, and you get to see her in action, which I think is going to be really fun. That character is just so damn cool looking. Like, okay, let's see what we can do with her. Let's put her in action and see what happens." John Boyega has promised a face-off between Phasma and Finn for The Last Jedi, so we also have that to look forward to as well. There is even a possibility that Captain Phasma may remove her helmet, which could add another dimension to her character that was not evident in the first installment. Maz Kanata's part will be smaller, but perhaps we'll get some knowledge about how she acquired Luke Skywalker's lightsaber in the movie. The wait is finally almost over for Star Wars: The Last Jedi and more information is starting to pour in as the release date nears. Though we'll have less Maz Kanata, we'll get some more Captain Phasma, which is definitely a good thing and might even hint at the perceived darkness of The Last Jedi. Lucasfilm is still doing a great job of keeping the lid on most spoilers, but it's only a matter of time since the movie is set to be released in just a few short months.